Hackney is well-known for being one of the greenest Boroughs in London – in fact there are over sixty parks, gardens and open spaces in Hackney. The range is as impressive as the quantity; from the largest concentration of football pitches in Europe at Hackney Marshes to the beautiful and historic settings of Springfield and Clissold parks; from the wonderfully hip and happening London Fields to the sedate walled garden and the Hackney City Farm within Haggerston Park. However, there is also a semi-secret green space in Hackney and it is a little bit special. 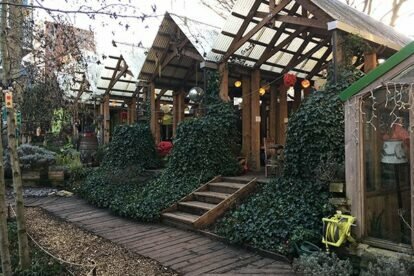 Tucked away on what used to be an old railway line is the little oasis that is the Dalston Eastern Curve Garden. I realise that describing it really won’t do it justice – it’s small, there are birch and hazel trees, butterfly bushes, herbs and fruit and veg and little sculptures and odd bits of art here and there and a beautiful glasshouse called the ‘Pineapple House’ – but it is so much more than just that, thanks to the incredibly urban setting. There are regular events and workshops (for both adults and children) if you want to join in or you can just sit, enjoy a coffee and relax. But, be quick as thanks to the developers the area is going to change soon.